An Introduction to the Mathematics of Financial Derivatives is a popular, intuitive text that eases the transition between basic summaries of financial engineering to more advanced treatments using stochastic calculus. Requiring only a basic knowledge of calculus and probability, it takes readers on a tour of advanced financial engineering. This classic title has been revised by Ali Hirsa, who accentuates its well-known strengths while introducing new subjects, updating others, and bringing new continuity to the whole. 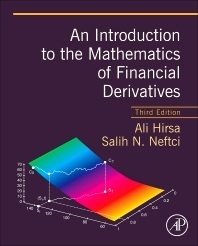 Popular with readers because it emphasizes intuition and common sense, An Introduction to the Mathematics of Financial Derivatives remains the only "introductory" text that can appeal to people outside the mathematics and physics communities as it explains the hows and whys of practical finance problems. Upper-division undergraduates and graduate students seeking an introduction to the mathematics and concepts underlying financial derivatives in specific and investment vehicles (options, futures, and other financial engineering products) in general. 24.2 Why Study Stopping Times? Ali Hirsa is a professor and co-director of financial engineering at the Industrial Engineering & Operations Research at Columbia University. He is also Managing Partner at Sauma Capital, LLC and Senior Advisor at DV Trading, LLC where he was Managing Director and Global Head of Quantitative Strategy from June 2016 to August 2017. Ali was a Fellow at Courant Institute of New York University in the Mathematics of Finance Program from 2004 to 2014. He is co-inventor of “Methods for Post Trade Allocation” (US Patent 8,799,146). The method focuses on allocation of filled orders (post-trade) on any security to multiple managed accounts which has to be fair and unbiased. Current existing methods lead to biases and the invention provides a solution to this problem.